And it is very unlikely that a "living machine" will be able to do that, as the distance, the time spent in near zero, will be far too large to actually survive when used in a "living machine" having the required complexity to actually a) find interesting information; b) evaluate it; c) forward it in a suitable way to us; d) evaluate a good spot for refueling/repairs/replication; e) executing whatever necessary to refuel/repair/replicate. The "living" machines you are familiar with might not be able to deal with those things. Our 3D-printing technology is becoming better and better. When we get 3D printers that can print new replicas of themselves, we have most of what we need to create self-replicating probes. Not on the time-scale of the universe, though. If it takes 10 000 years to set up an industrial base in a new system and then made enough new probes to colonize only 10 new systems, it'd still blanket the galaxy in well under a billion years. However, for humans, 10 000 years might be a lot of time if the likelihood of exterminating ourselves with the amount of nuclear weaponry we have right now, is 1/250 every year. Most humans might consider this to be an acceptable risk, since humans don't expect to live 250 years, and don't seem to care so much about their great-grandchildren. However, if we during the next decades get an additional risk of exterminating ourselves with killer robots of 1/100 every year, and an additional risk of exterminating ourselves with biological engineered weapons of 1/250 every year, people might start to consider these risks to be of somewhat importance. Or manufacture one in-situ, to create a material base to create a larger one, to be able to create a new probe. Most materials do work not well in 3d printers, and will never become as durable as standard manufactured stuff from the same materials. Plastics may work well in 3d prints, but plastics are notoriously bad with radiation, and extreme colds. Why though would a civilization be interested in initiating a process that has a billion year time frame? The reason I said packing a probe with the industry necessary to self-replicate was not feasible earlier is because the framing I was using assumed that an alien civilization would want to minimize the time it would take them to get results. Sending lots of bare bone probes in as short a time as possible from their home sphere is a far superior method, while waiting for evidence of intelligent life to reach them on its own and then trying initial long range communications is better still. Could a probe be packed with the tools needed to mine elements in alien solar systems and then process them into whole new probes? Sure, but there's not a benefit to doing that because they're not going to see result in any reasonable time frame. I have actually made a new type of chromatography columns myself, which can be used to isolate/purify molecules. I have even started a company which specializes in isolation/purification of molecules with these columns. We have actually considered the possibility of making these columns by 3D-printing in the future. Most of the machinery you need can presumably also be made by the same 3D printer that is capable of making a replica of itself. and will never become as durable as standard manufactured stuff from the same materials. Really? Perhaps there is some "magic" involved when you produce things in the old way? The materials get some kind of additional "magical" strength then? There are lots of different types of plastics available for 3D printers today. Some of them are quite resilient. And yes, the way the material is handled does affect its properties. E.g. plastics. 3D printing usually sticks them together, becuase they're hot, and thusmelt a bit together. But using injection moulding is different. It pressurizes stuff together. It took me some years to understand the mechanics of injection moulding, and how to use the marterial flow to optimize parts strength. 3D printing is getting better and better, and we use it too, especially for low production numbers, but the material strength differences are tremendous. 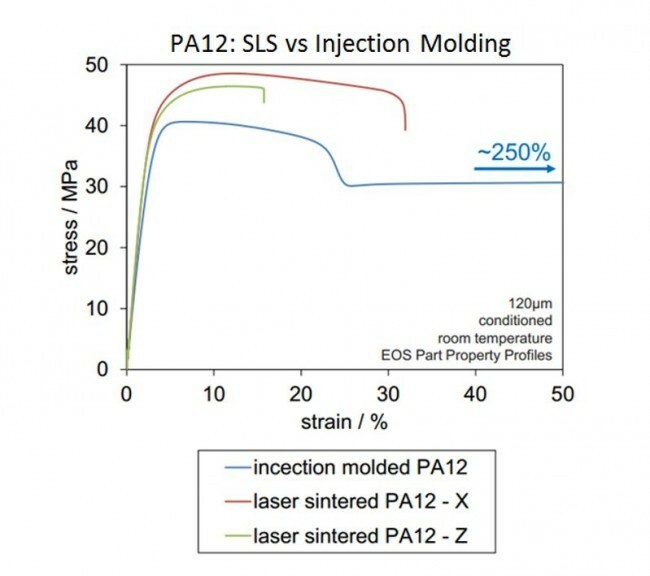 3D printing are globs of plastics, that has the plastic molecules within that ball, and it stays that way, while injection moulded molecules remain parallel, and thus exhibiting different characteristics in different directions of the moulded part. I'm waiting to evaluate the results from that hyped 3D printing machinethat visited the ISS.... And get my hands on those parts. 3D printing is great, but it has different uses. Time will tell what it can achieve. And what not. 3D printing is getting better and better, and we use it too, especially for low production numbers, but the material strength differences are tremendous. Do you have any data based on real measurements to substantiate this? And not just for a single type of plastics, but for lots of different types to see if this effect is equally valid for all types of plastics. None which I can link here to, proprietary documentation. Sorry. I found this article from 2014. 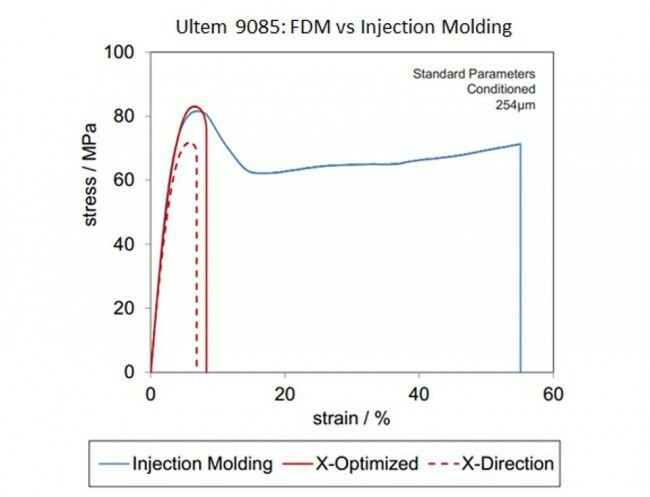 According to these graphs, it looks at least like these types of plastics can take more strain if they are injection molded. I don't think 3D printed materials can ever orient the molecules in the way injection moulded plastic does. It has its uses, and will have its uses. But sometimes things simply are the way they are, and due to the manufacturing process difficult to change.